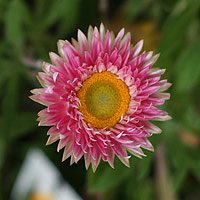 If you are looking for a low maintenance long flowering plant then Bracteantha bracteata commonly called ‘The Everlasting Daisy’ could be it. 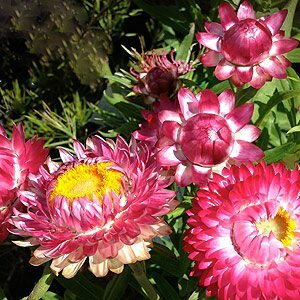 Free flowering and great for cut flowers as well as garden use, this is plant that comes in a number of forms, annuals and perennials, low growing to small shrubs. The flowers are a favourite for dried arrangements as well as for fresh cut blooms. Bracteantha bracteata are found from tropical Queensland right across to coastal Western Australia and are a varied species in terms of both growth habit and required conditions. 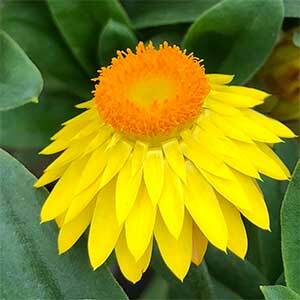 B. bracteata are often referred to as ‘Golden Everlasting’ or ‘Strawflowers’. 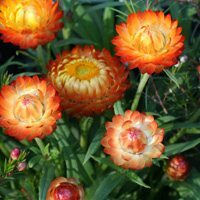 The name changes over recent years are a little confusing, originally Helichrysum, now Xerochrysum bracteatum but commonly Bracteantha bracteata. they have been extensively hybridised both in Australia and overseas, so a little confusion exists regarding names. One of the earliest of all Australian plants to be hybridised they have been grown in Europe since the mid 1800s. Widely used for the long flowering period from early spring right through to autumn both perennial and annual varieties are available. Again they are a varied group with plants ranging from low growing mat forming types to small bushes. Propagation is from seed, or from cuttings. Although all varieties require a well drained soil and full sun, some do seem to cope well with light dappled shade. Generally a humus rich well drained soil will do nicely. Although they are regarded as drought tolerant, in hot dry conditions they will begin to wilt a little, so some extra water in these times is required to keep most species looking good. These are a tough plant, drought tolerant, however better in a humus rich soil with some moisture over the flowering period. They grow well in full sun, however flowers are a little better with protection form the heat of the afternoon midsummer sun. Easy from cuttings taken in spring, also possible from seed. The perennial types need to be pruned and this should be carried out in mid winter just as new growth begins. Simply prune away all of the old foliage back to where signs of new growth are evident. 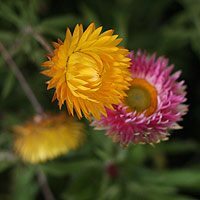 Common Name – Everlasting Daisy, Strawflowers, Golden Everlasting. Spread – To 1 metre usually less. Flowers – Varying in colour, Yellow, Gold, Pink to Purple. Flowering Season – Spring through summer to Autumn.